Two bottles, different shapes but more or less the same labels. A change of bottle supplier, perhaps? 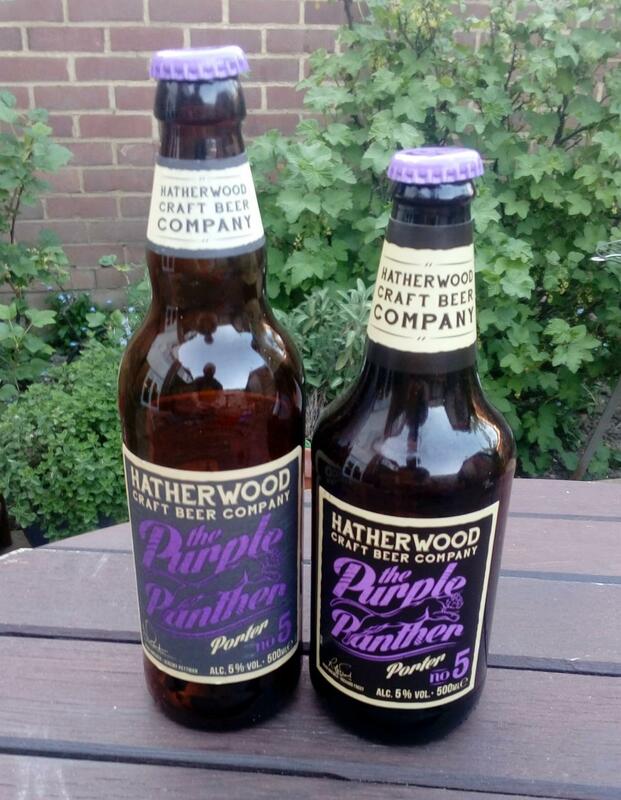 No, a change of brewer - Lidl UK has moved production of its Hatherwood Craft Beer Co own-brand from the Marston's group to Shepherd Neame. I don't know why, but I assume Sheps offered a better deal. All the names and descriptions are the same though, and presumably so are the recipes. But how could they be the same beer, when production has moved to a new brewer? 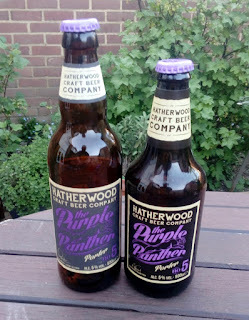 Even more so in this case, when it's also moved right from one end of the country to the other - Purple Panther was brewed at Jennings in Cumbria, and Sheps is in Kent. Fortunately, one of my local Lidls still had a few examples of the old version on the shelf alongside the new, so I grabbed a couple of bottles of the Porter (as I've enjoyed it in the past) with a comparative tasting in mind. It took a couple of weeks before an opportunity and a couple of willing assistants came along. Without them seeing, I poured samples into six numbered glasses and gave each of them two of one version and one of the other: the initial challenge was simply to pick the odd one out. And they did it. The two were remarkably close, yet subtly different - and it wasn't even age. Assuming I read the bottles rightly, the Jennings version was bottled in January and the Sheps one in February. When I tasted them myself, the Jennings one seemed ever so slightly more dry and burnt, while the newer version was just a little softer and its cocoa note a tiny bit more pronounced. An interesting exercise, and a lesson in just how hard it is to move a beer from one brewery to another without changing it, no matter the work and expertise that goes into taste-matching. Same with the foreign beers brewed here under licence. On several occasions I sampled the real thing on holiday, Kronenbourg, Grolsch etc., and what a difference. Going back many years, Sainsbury's used to sell a 6.2% ABV canned Diät Pils, which was brewed in Germany and was surprisingly good. Then the brewing location was subtly switched to Belgium, using the same can design, and it wasn't so good. And then it was moved to the UK, and it was horrible.